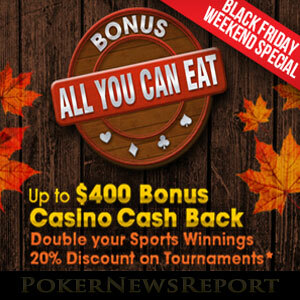 Players at Americas Cardroom are in for a Thanksgiving treat from tomorrow. 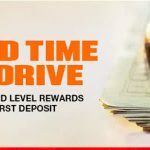 The site is hosting a series of four special promotions including a “Build Your Own Bonus” offer, in which players can earn a no deposit poker bonus of up to $400. There is also a sports freeplay offer, cashback on casino losses and 20% discounts available on the buy-ins for the weekend´s biggest tournaments. Americas Cardroom has also just started a comprehensive satellite schedule for its forthcoming Million Dollar Sunday on December 18. Players can attempted to qualify directly for the $1,000,000 guaranteed tournament from just $6.00, or play in one of the Freebuy sub-satellites that awards seats in the Mega-Satellites immediately preceding the target event. The “Build Your Own Bonus” offer gives players an opportunity to add up to $400 to their bankrolls. Over the next four days (starting tomorrow), Americas Cardroom will give players a $10 bonus for each 100 hands of real money cash game poker they play. There are no exclusions to the games or stake levels players can play, although the hands must see the flop to contribute towards the total. Players can earn no deposit poker bonuses of up to $100 each day from Thursday to Sunday. The total bonus will be credited to players´ accounts next Monday, and is cleared at the rate of $5 per 100 Award Points generated before 31 January 2017. Please note it is important to opt into this promotion to take part. Instructions for opting in can be found in the Rewards Section of the Americas Cardroom client. The sports freeplay and casino cashback offers also start tomorrow. The sports freeplay consists of a free bet of up to $25 if the first sports bet placed at Americas Cardroom from tomorrow is a winner. The site will match the amount won up to $25 provided that the event bet on has qualifying odds of between -200 and +200. There is no rollover or clearing requirement with this offer. The casino cashback offer also has no rollover or clearing requirement. Quite simply, Americas Cardroom will refund 5% of players´ net losses at its online casino if they lose money between midnight tonight and midnight on Sunday. Hopefully not too many players will be looking to take advantage of this offer but, for those that qualify, the cashback will be credited to players´ accounts on Tuesday. There should be plenty of value around for tournament players at Americas Cardroom this weekend, as the site is discounting the cost of buying into forty-two of its biggest tournaments, while maintaining the guarantees for each event. The 20% discounts start on Friday and include the $115,000 guaranteed Sunday Special, which players can buy into this weekend for $172 rather than the usual $215. Other tournaments that are included in the discounted selection include Fridays $15,000 guaranteed “Big 10” tournament, the $20,000 guaranteed “Saturday Six Pack”, and Sunday´s $100,000 guaranteed “Warm Up” tournament. It will be interesting to see if these events still meet their guarantees, or if there will be some substantial overlays in the site´s feature events. Although the next Million Dollar Sunday at Americas Cardroom may still be four weeks away, the site is hosting a stack of qualifiers and sub-qualifiers for the event. As mentioned above, direct qualifiers start from just $6, while Freebuy sub-qualifiers (games that are free to enter, but in which players can re-buy and add-on at a cost) are running throughout the day and awarding seats into three Mega-Satellites that have a combined total of 300 seats for the Million Dollar Sunday event. Players looking for some more free poker money might like to take advantage of Americas Cardrooms latest Welcome Package. In addition to a 100% match on first deposits up to $1,000, the site is offering first time depositors free Jackpot Poker for twenty days. To qualify for these offers, you need to create your account using the Americas Cardroom Promo Code “PNREPORT” and make sure you deposit a minimum of $50 into your account.